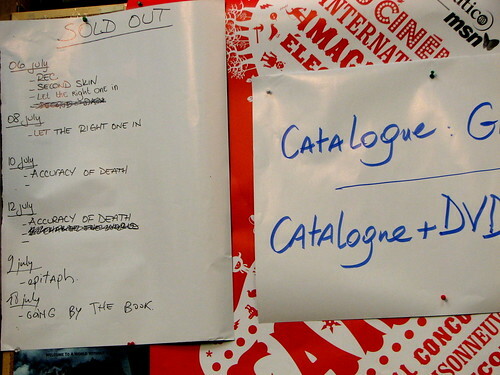 Comme à l'habitude, vu que le festival ne le fait pas sur son site, voici les films sold-out après le quatrième jour de Fantasia 2008. Les deux séances de "Accuracy of Death", le blockbuster japonais mettant en vedette l'acteur Japano-Taiwanais Takeshi Kaneshiro, sont sold-out depuis la journée d'ouverture, et une séance supplémentaire a été annoncée pour le 11 juillet à 15h dans le Hall. 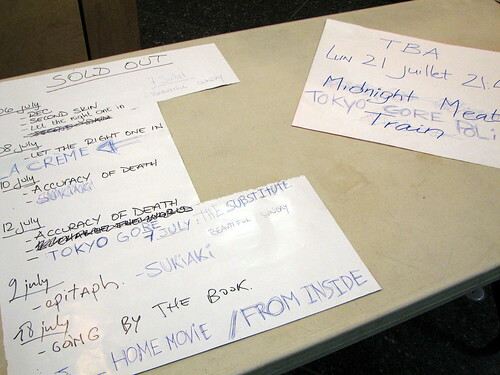 As usual, since the festival isn't doing it on their site, here are the sold-out movies after the fourth day at Fantasia 2008. 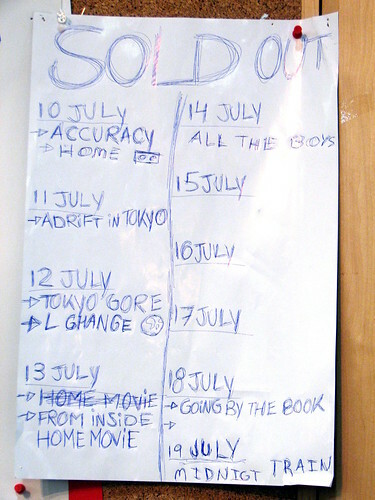 Both screenings of "Accuracy of Death", the Japanese blockbuster starring Japanese-Taiwanese actor Takeshi Kaneshiro, are sold-out since opening day, and an extra showing was scheduled on July 11th at 3PM in the Hall. My friend Rob started a new movie blog, which starts with coverage of the Fantasia festival. It's called When we see the Ocean. It's this time of the year again... Earlier than other years, by a week or two, I think. Here is the English version of the press release for the Asian programming of the festival, directed by Mi-Jeong Lee. Asian Fever is about to rock Montrealers! The Fantasia International Film Festival presents a huge variety of Asian feature films in 2008, over 70 in fact, from China, Hong Kong, Japan, South Korea, Thailand and Vietnam. They are nothing less than outstanding, groundbreaking, hilarious, and emotionally gripping! Since its inception in 1996, Fantasia has provided a unique opportunity for the mainstream and the underground filmgoers alike to share the experience of Asia's action, fantasy, martial arts, horror, historical epic, surrealist hybrid and guerrilla films. Since then, Fantasia's success and reputation have snowballed to become internationally recognized and acclaimed as having a wildly diverse sense of what Asian cinema is and has the potential to be. The original, peculiar cultural flavor and cinematic qualities of Asian films has not been lost on Hollywood. Asian films are considered to be the hottest films on the world market today. Their inventiveness, authentic humor and surprising cultural perspectives, combined with their outstanding aesthetic accomplishments, are copied but never duplicated. At Fantasia 2008, new works will be screened by such internationally acclaimed directors as Japan's Takashi Miike (SUKIYAKI WESTERN DJANGO) and Hideo Nakata (L: CHANGE THE WORLD); Hong Kong's Johnnie To (MAD DETECTIVE, SPARROW, TRIANGLE) and Oxide Pang (THE DETECTIVE); and South Korea's Kwak Kyung-taek (A LOVE). Also, not to be missed are the ambitious, fresh and entertaining debut films of first-time directors, such as those from that current hotspot of Asian film production, South Korea. Film enthusiasts are sure to enjoy the many debut films from directors such as Yang Hea-hoon (WHO'S THAT KNOCKING AT MY DOOR? ), Kim Mee-jung (SHADOWS IN THE PALACE), Ra Hee-chan (GOING BY THE BOOK) and Lee Kyoo-man (WIDE AWAKE). Watch also for the Hong Kong upstart Derek Kwok (THE PYE-DOG). The splendid line-up of invited guests is getting longer as the opening of Fantasia 2008 approaches. Hong Kong's Kung Fu icon, Gordon Liu, will grace Fantasia with his presence during the opening weekend as he presents a restored 35mm ShawScope print of the Shaw Brothers classic DISCIPLES OF 36TH CHAMBER. The Japanese actress Eihi Shiina, star of Miike's infamous Audition, will be in Montreal with her new film, TOKYO GORE POLICE, along with the film's director, Yoshihiro Nishimura. The Japanese actor, director and action choreographer Tak Sakaguchi will also be in Montreal, to present in person his film BE A MAN! SAMURAI SCHOOL. Moreover, Thai directors Banjong Pisanthanakun, Parkpoom Wongpoom, Yongyoot Thongkongtoon and Gunn Purijitpanya will also be in town for the screening of their omnibus films 4BIA. Banjong Pisanthanakun and Parkpoom Wongpoom will also be pleased to present their film ALONE. From among the most renowned Asian film industry professionals, we highlight two guests from CJ Entertainment (CJ): Kini Seong-Eun Kim, Vice-President of International Sales and Heejeon Kim, Director for Festivals will attend the festival. CJ is the largest production and distribution company in Korea, with an enviable international reputation in managing Asian Cinema. 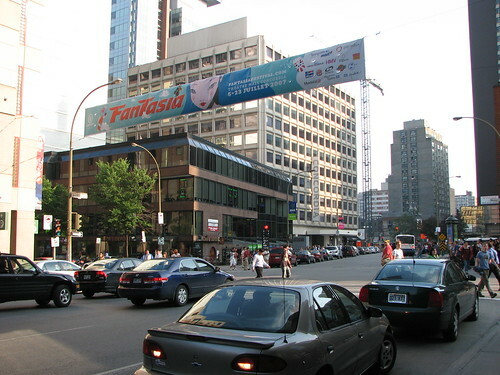 CJ will seek for opportunities for Canadian marketing development while presenting SHADOW IN THE PALACE, and five other films at Fantasia 2008. Fantasia, a pioneering festival in the world of Asian genre film, is ready to meet its audience! Through this cinematic adventure, Montrealers will discover a wide range of films grouped according to themes for greater access than ever before, such as Singular Successes, Converging Visions, Uncanny Investigators, Leading Ladies of Asia, From Mangas to Movies, First Films from Korea and Strange Loves. We also highlight the Nikkatsu Action Film spotlight, and a variety of loose films that simply demand to be noticed! And finally, to conclude this year's Fantasia, went to catch Memories of Matsuko, a movie by the same guys behind Kamikaze Girls. Colorful, flowery, extremely bittersweet. Tragic event after another, told in the same sugar-coated manner (which style it is all about). It became a tad long (130 minutes, it was), as we sorta get that Matsuko's life was tragic and that the mystery surrounding her death should be quickly revealed. Felt a lot longer than it really was (103 minutes), and was reminiscent of a previous Kiyoshi Kurosawa movie, Doppleganger. Sort of à la Suicide Club, started becoming comically odd two-thirds into the movie. Subversive, with all the politically-incorrect contents that it may afford. It was an awful movie, awfully-behaving that is. But also somewhat awful in the form. All the "American" women happened to be slavic (per their accent). Contrarily to what was previously announced, there won't be free screenings of those premiering HK flicks, for reasons still unknown (none of this was even announced on the website). There is also an extra day of film presentations, as it has usually been the case. Continue reading Fantasia 2007: Yves Montmayeur. The most notable of this triple-header (originally advertised as a double of the two first ones) was necessarily In The Mood For Doyle. It was what impressed festival programmers and movie-goers alike. If you are a fan of Christopher Doyle, which is the case for most fans of Wong Kar-wai, then this is a must-see, if you can find it. The director, Yves Montmayeur, was in fact present to introduce the films. In a single ride, we're able to meet all the characters of Mister Doyle, a really really crazy (dingue) man, as translated by singing on Night Shyamalan's set, or pseudo-impromptu disruption of the Olivier Assayas interview. The other two were 30-minute episodes destined for TV. The Milkyway Image one was more a sort of making-of for several movies of the HK-based independent film production house. The treatment for the latter two was also different, as there was no narrator in In The Mood For Doyle. unny bit in the Milkyway one where Andy Lau attempts English - he should never do that again. Mr Montmayeur stayed 15 minutes after the movie answering questions, from whether he was influenced by Chris Doyle for the making of the documentary, and how long it took him to know this fantastic circle of HK celebrities. Style, style, style. Fantasia movies, why are you always about style? Very stylish, but it is about what it is, a treat for the eyes, entertaining entertainment. Probably another movie ordered by the Macau Tourism Board (see Isabella). Asian film fest in Montreal? I do find it a little illogical to bundle Asian films with fantastic films, into something called "genre", but with a limited market for Asian films in Montreal, there does not seem to be an alternative way. A quick search on the Internet indicates that Toronto has a Toronto Reel Asian International Film Fest since 2002 (with After This Our Exile as North American premiere on opening night), whereas Vancouver has a Vancouver Asian Film Festival since 1996, which are both relatively smaller festivals than Fantasia, in terms of movies shown (80-90 and 40-50, respectively, versus Fantasia's 200+). In a sense, it's absolutely fine like this, because the end result is still the screening of recent high-quality Asian/Chinese films in theatres for a ridiculously low price ($6.50) which no mainstream cinema is able to match. Besides, my movie list never ever matches those of the fantastic/horror film seekers... Whereas I was not attracted to last year's festival premiere The Descent, they probably were not towards this year's Tekkon Kinkreet. I suppose that we eventually meet at (the rather cheap) The Matrimony, but not at (the movie-award gatherer) After This Our Exile. Continue reading Asian film fest in Montreal?. Continue reading Fantasia 2007: 13 Beloved. Perhaps does not have the most convincing plot or most enticing storyline, but shows off Macau beautifully, on the visual, but also (especially) musically. The title of the movie (same as the leading actress' first name) is suggestive of the "video album" type, but isn't quite it, as she doesn't monopolize the screen at all. 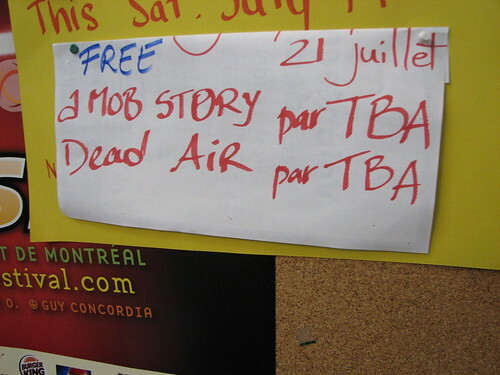 The two HK movies that were originally canceled, A Mob Story and Dead Air have been re-announced on Fantasia's ticket booth board as free movies, to be shown at their original planned date and time on Saturday July 21st. Both are shot in HD. According to the paper version of the Fantasia program (b/c both movies are not linked from the current site), Dead Air (7:00PM) is an International premiere, while A Mob Story (5:00PM) is a North American premiere. 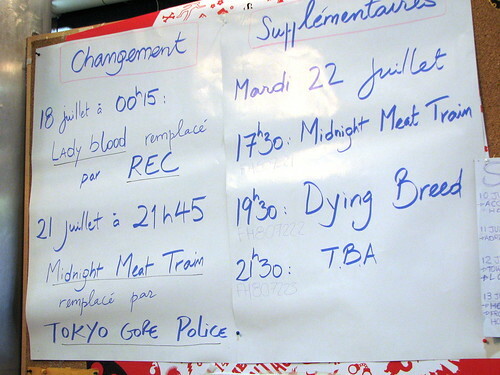 The people at the booth said that these movies were in fact re-showing for free, but did not have more infos. Since there isn't an official press release as of Sunday the 15th, someone could possibly e-mail the Fantasia organizers for an explanation. The Matrimony is a film shot on the Mainland, we think, or at the very least set in pre-war colonized Shanghai. it is a horror flick, but definitely we thought that it was cheap, oh so cheap, with alternate reality endings, and pianos/violins thrown down the stairs. Because it is Fantasia, it is still recommendable. There was no Rene Liu / Fan Bingbing cat fight. After This Our Exile plays again on Friday night at 8:50PM, and was far from being sold out tonight (I bought ticket 70-something two hours before the screening, for a theatre that contains 173). Last chance to catch it in a theatre in Montreal probably. 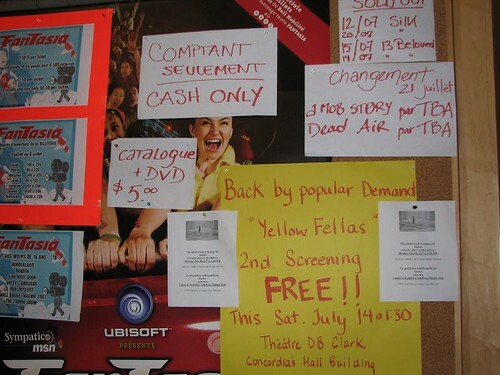 See photo entry of Yellow Fellas Canadian premiere. Suffers from the same problem that afflicted Spielberg's A.I., even if this one does it rather more self-consciously (by displaying credits way before movie's end). Three actors, Charlene Choi, Shawn Yue and Isabella Leong, share the screen for 99% of the time. Advertised as a fright movie, so when everything ends quite logically, one's necessarily disappointed. Yet another palace drama flick... Zhang Ziyi is so annoying (as an actress and the film character) that you wish she'd be killed off rather quickly, but not. Zhou Xun won a prize as supporting actress in HK's movie awards this year, despite a minuscule, but pivotal, role. Movie plot is directly inspired by Shakespeare's Hamlet, so don't act as if you could not predict the ending. Also, a video entry of the Yellow Fellas premiere. 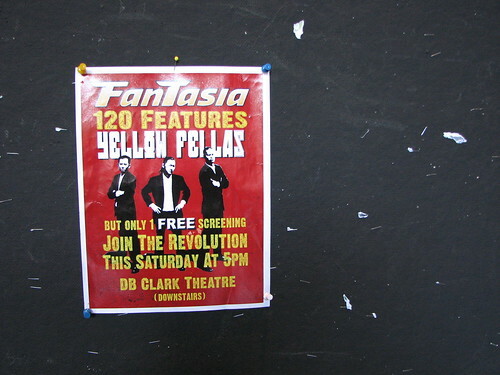 Continue reading Fantasia 2007: Yellow Fellas. Good entertainment, and a hell of a ride that held itself for the first 90 minutes. Of the quality you'd expect for a Hong Kong movie in 2007. But pretty boy Edison Chen as a animal-like assassin? As plausible as Stephen Chow in a WKW movie. Tekkon Kinkreet is visually stunning, and really the quality of a blockbuster, if only people in the West did not have a prejudice against animated films. I did not read up at all, except to make sure about Michael Arias' credentials, as we all have natural doubts about a non-Japanese person doing an animation film. The result was beautifully rendered, shows off the possibilities of anime made with heavy usage of computer tools (that scene of Mr Snake wandering the hallway of Mr Suzuki's hideout). Treasure Town, so rich in details (some of which laughter-inducing to an English-speaking audience), is an absolute treat for the eyes. Still a lot of cinema ahead, but this one deserves keeping the temporary top spot for a while. See Petronia's review of Tekkon Kinkreet. Continue reading Fantasia 2007: Opening Night and Who We Saw Waiting In Line. - Yellow Fellas is the only free movie of the festival, on a first-come first-served basis (YouTube trailer). Added coolness, we bumped into the director, Tetsuro Shigematsu, while waiting in line, and he confirmed the oddity of the free screening. Now, the following is the actual tickets lineup and numbers between square brackets were the number of tickets already sold Tuesday July 3rd (first day tickets go on sale) at 7:30PM, time we bought our ticks at, according to that seemingly-but-not-random number on ticket, to give you an idea of the affluence to certain movies. Capacity of theatres: (H) Hall Theatre: 720 seats; (C) DB Clarke: 380 seats; (S) J.A. De Sève: 173 seats. Source: Fantasia 2003 + Concordia. Sun Jul 22: The World Sinks Except Japan (H) 7:40PM ; Yobi the Five-Tail Fox (H) 12:00PM . (H) Hall Theatre; (S) JA De Sève; (C) DB Clarke. 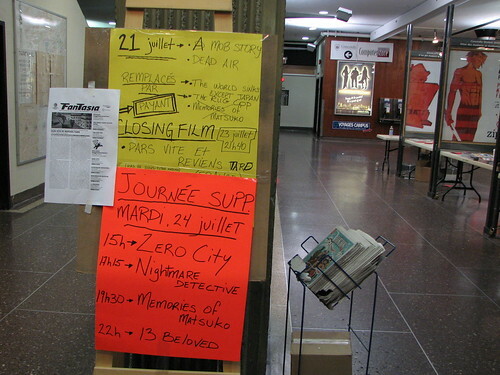 It's once again this time of the year, that of Montreal's Fantasia film festival, starting on July 5th to 23rd, with more than 125 feature films instead of just a mere hundred last year, thanks to money from the provincial level. I definitely going to hit the East Asian films first, although I've also tried European horror flicks and American sci-fi movies in the past. Fantasia is also adding an extra venue, Théâtre DB Clarke, which is a 380-seat room (the one that we call the Hall is 700-seat), home of Concordia University's Department of Theatre, at the basement level of the Hall Building. This year's installment will celebrate Russian cinema with seven films spanning the 30s and 80s, as well as five others exploring the theme of urban apocalypse (see special events). From Hong Kong, you have the winner of like all HK movie awards of this year (three of them: Best Actor, Best New Actor, and Best Director), After This Our Exile, not to be confused with the excellent-looking 200g Johnnie To Exiled. The latter was also nominated in the best film category, and both Isabella and Dog Bite Dog each had a Best Actress/Actor nomination at HK's movie awards (nominees list - you have to guess the best ones, b/c they don't seem to consolidate them on one page). There is also an Oxide Pang movie called Diary. Too many to parse through right now, but this year's lineup also includes a bunch of "oddities", like documentaries on animated film director Hayao Miyazaki or cinematographer Christopher Doyle. And as usual, the animes, the Japanese horror flicks, and a couple of Korean commercial films, like 200 Pounds Beauty. Continue reading Fantasia 2007: preview. This page is a archive of recent entries in the Fantasia category. Egypt 2005 is the previous category.